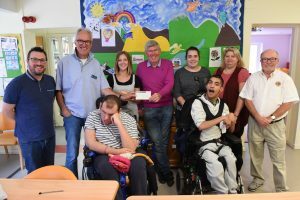 This morning Henley Lions Club presented a cheque for £1,000 to The Chilterns Centre to fund their “Moments to Remember” programme. This is the fourth consecutive year that Henley Lions have funded this project. The scheme, originally called A Day to Remember, was the idea of Lion Ian Forster who proposed that we could bring the British seaside to the Chilterns Centre for the patients and their families to enjoy. That was a huge success and was enjoyed by everyone who took part. This has since been transformed by Pamela Lee of the centre into Moments to Remember which take place throughout the year and which are equally enjoyed by patients, families and staff. Accepting the cheque on behalf of the centre was Paul Barrett, Chairman of Trustees. In the photo below are, from left to right, Gareth (Deputy Manager), Lion Ian Tritton, Eddie, Anna, Paul Barratt, Danii, Waqas, Lorraine and Lion Ian Forster. Henley Lions are very proud of our excellent relationship and continued support of the Chilterns Centre. 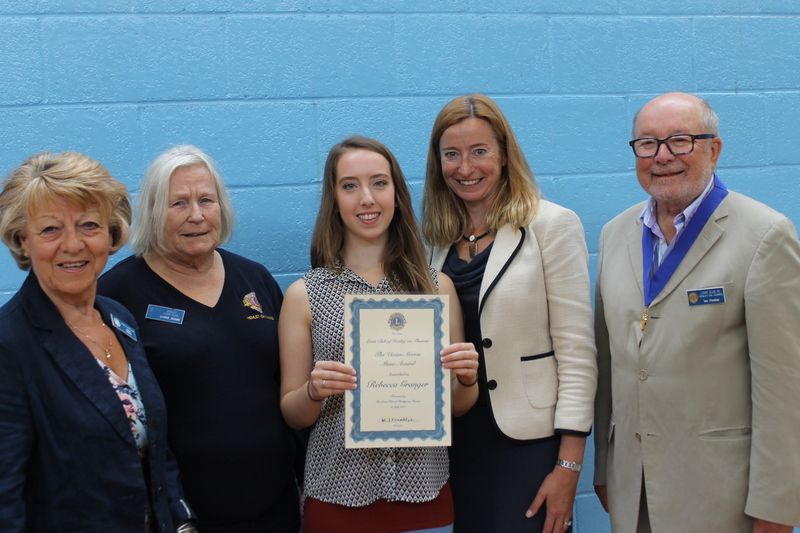 The Vivian Morris Music Award for 2017 was presented to Rebecca Granger of Gillotts School. 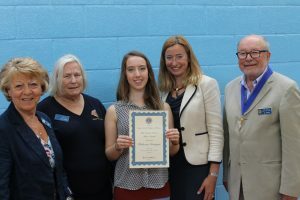 Becky was selected for the award by school staff for “her commitment to our extra curricular activities by being part of choir as well as her attitude to learning in lessons, consistently being positive and always putting effort into her work.” Rebecca loves to sing and plays piano. She’s also recently started to learn the guitar. Rebecca will be going to Henley College in September when she’ll be studying Dance, Drama and Psychology for A Levels. Rebecca said, “I was stunned to have received this award. I don’t know what I will spend the money on yet. I’m looking forward to performing in the Henley College shows. Their first show is The Addams Family which I’ll be auditioning for.” Henley Lions thank Michaela Clarke of the Henley Herald for the photo and for interviewing Becky.